Ryan Blaney and the No. 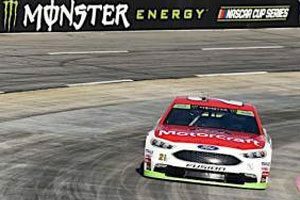 21 Motorcraft/Quick Lane team remain in contention for a spot in the championship round of the Monster Energy Cup playoffs after surviving a fender-banging First Data 500 at Martinsville Speedway. Blaney scored points in the first two stages, lost a little speed midway through the race, then battled back into the top five for the start of an overtime run to the finish. But he was swept up in a multi-car crash at the finish line and wound up finishing eighth. That put him sixth in the points standings but just six points shy of being in the top four. The top four in the standings after the next two races – at Texas Motor Speedway and Phoenix Raceway – will compete for the title in Ford Championship Weekend at Homestead-Miami Speedway. Blaney started Sunday’s 500-lapper from the fourth position and scored nine critical points in both of the race’s 130-lap Stages. He was seventh in the first stage and sixth in the second. He and the Motorcraft/Quick Lane team battled back from a tire rub midway through the race and dropped out of the top 10 for a time. But on the final pit stop, crew chief Jeremy Bullins hit the target on the chassis set-up, and Blaney was able to drive his way into the top five for the start of an overtime run to the checkered flag. Even with his involvement in the last-lap crash, Blaney dropped just three spots in the finishing order, preserving an impressive points day. “The last handful of restarts were just pandemonium,” Blaney said. “It was pretty ridiculous with everyone wrecking each other and running into each other. “I thought we were going to make it through the last one, but we just kind of got caught up off of [Turn] Four in all that stuff. At least we salvaged a decent day. The ending of the race, while disappointing, wasn’t what team co-owner Eddie Wood had on his mind as he left the track Sunday night. “It was just a crazy weekend at Martinsville,” Wood said. “Ryan did a great job of keeping the car straight all day, and we can go to Texas still in a good spot in the points standings. “And we had a great Fan Appreciation Day at the museum in Stuart on Friday. There was a huge crowd there, and a lot of kids having a great time.